This beautiful, unique teddy is a wonderful addition to any collection.. Sometimes creativity arises from adversity, and this one of a kind unique bear is a beautiful example of that. 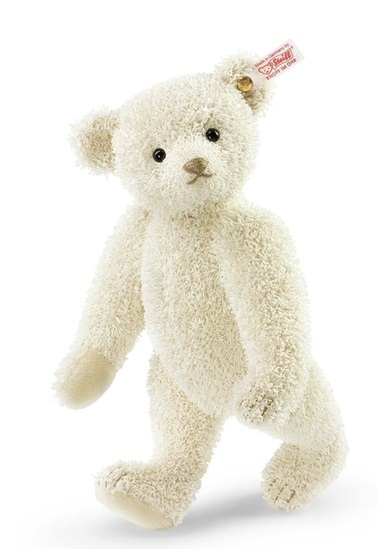 New in 2014 from Steiff's Worldwide Exclusive Collection, we are pleased to share this "Paper Teddy Bear". This is 11-inch snow white paper plush teddy bear that is 5-way jointed with the head and arms loosely attached to the body. Her paw pads are a soft white plush. This teddy bear is made from a special type of paper based fur. At the end of World War I, Steiff was faced with a lack of wool and similar plush materials. As innovative as the company is, they were able to find ways to produce bears and animals with a substitute paper-based material from 1919-1921. This fabric made a comeback in 2010 with a special replica exclusively for Steiff Club members. This is a one of a kind treasure that will be a stunning addition to any collection.